When it comes to choosing your wedding location, what comes to mind? But as any bride knows, there's so much more to take into account! Ideally you only have one wedding day and it can be impossible to make the decision with the endless amazing possibilities that are available. The island country of Mauritius in the Indian Ocean is one of the most picturesque destinations in the world. 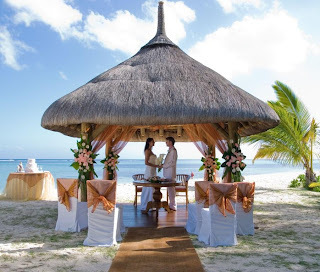 Long time favorite tourist spot, Mauritius has now also gained popularity as a wedding destination. Endless beaches, perfect weather and a friendly atmosphere add that extra dash of romance to your wedding. Another romantic choice is Venice. The Italian city is known for its natural beauty and an old world charm. Whilst in Venice you can do the most romantic thing by getting married on a luxury gondola while you cruise down the beautiful canals. Keeping the wedding close to home, you may want to get married in a park/garden close to Sydney's famous landmarks. The Royal Botanical Gardens are tucked in behind the Opera House with the Sydney Harbour Bridge in the Background, making for some fantastic photos. Not quite as local as Australia, but not too far either is picturesque New Zealand. Looking for a romantic wedding location? Fly by helicopter to the top of a mountain in New Zealand for panoramic views of lakes, rivers, mountains, and the rugged New Zealand landscape. 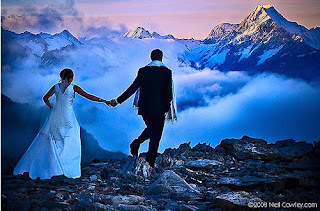 New Zealand Wedding Services will also assist you with planning a wedding on top of a glacier or in a number of charming country churches. Paris may have been the city of love but New York is now fighting for the title, and Central Park is the heart of the city. You'd want to be thinking of the man you're marrying and not the charming Mr Big come your wedding day though! Wherever you get married, make it memorable, special, romantic and fun!